FLORICAU, D. , TUDORACHE, T. , KREINDLER, L.
In this paper new three-level boost-type PFC PWM rectifiers with Multiplied-switching-Frequency (MF) are presented. They can work both at high and low switching frequency for single- and for three-phase unity-power-factor applications. The proposed solutions are named MF-Vienna PWM rectifiers (M=2 or 3) and are based on classical 1F-Vienna topology (M=1), the most popular PWM boost-type PFC concept with three voltage levels. By adding auxiliary active power device(s) to 1F-Vienna circuit and through proper modulation strategies, the ripple frequency present in the input and output passive components can be doubled (M=2) or tripled (M=3). This advantage leads to the reduction of boost inductor and line filter requirements. The operation principle of the 2F-Vienna cell is validated for three-phase PWM rectifier using Voltage Oriented Control (VOC) method. GWEC - Global Wind Energy Council, "Global wind report annual market update 2013," pp.1-80, Apr.2014. M. Liserre, R. Cardenas, M. Molinas, and J. Rodriguez, "Overview of multi-MW wind turbines and wind parks," IEEE Trans. Ind. Electron., Vol.58, No.4, pp. 1081-1095, Apr. 2011. L. Barote, C. Marinescu, "Modeling and operational testing of an isolated variable speed PMSG wind turbine with battery energy storage," Advances in Electrical and Computer Engineering, Vol.12, No.2, pp.81-88, 2012. F. Blaabjerg, M. Liserre, and K. Ma, "Power electronics converters for wind turbine systems," IEEE Trans. on Ind. Appl., Vol.48, No.2, pp.708-719, Mar./Apr. 2012. T. Tudorache and M. Popescu, "Optimal design solutions for permanent magnet synchronous machines," Advances in Electrical and Computer Engineering, Vol.11, No.4, pp.77-82, 2011. C. P. Ion, C. Marinescu, "Autonomous three-phase induction generator supplying unbalanced loads," Advances in Electrical and Computer Engineering, Vol.13, No.2, pp.85-90, 2013. I. V. Pletea, M. Pletea (Moisa), D. Alexa, N. Lucanu, "Simulations and analysis and operating regime as rectifier with power factor correction of two - quadrant converter with RNSIC," Advances in Electrical and Computer Engineering, Vol. 9, No. 3, pp. 18-21, 2009. T. Takeshita, N. Matsui, "PWM control and input characteristics of three-phase multi-level AC/DC converter," in Proc. Power Electron. Spec. Conf., pp. 175-180, 1992. J. W. Kolar and F. C. Zach, "A novel three-phase utility interface minimizing line current harmonics of high-power telecommunications rectifier modules," 16th IEEE International Telecommunications Energy Conference, Oct. 30 -Nov. 3, pp. 367-374, 1994. Y. Zhao, Y. Li, T. A. Lipo, "Force commutated three level boost type rectifier," in Proc. IEEE Conf. Record of Ind. App. Society Annual Meeting, pp.771-777, 1993. H. Midavaine, P.L. Moigne, and P. Bartholomeus, "Multilevel three phase rectifier with sinusoidal input currents," in Proc. IEEE PESC96, pp.1595-1599, 1996. M. S. Ortmann, S. A. Mussa, and M. L. Heldwein, "Concepts for high efficiency single-phase three-level PWM rectifiers," IEEE Energy Conversion Congress and Exposition - ECCE, pp.3768-3775, Sept.2009. 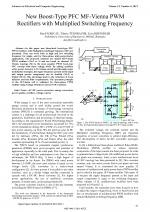 M. S. Ortmann, S. A. Mussa, and M. L. Heldwein, "Three-phase multilevel PFC rectifier based on multistate switching cells," IEEE Trans. Power Electron., Vol.30, No. 4, pp.1843-1854, Apr.2015. D. Floricau and V. Pangratie, "New unidirectional five-level Vienna rectifier for high-current applications," 39th Annual Conference of the IEEE Industrial Electronics Society - IECON, pp.1080-1085, Nov.2013. C. A. Teixeira, B. P. McGrath, and D. G. Holmes, "Closed-loop current control of multilevel converters formed by parallel complementary unidirectional phase legs," IEEE Trans. on Ind. Appl., Vol.51, No.2, pp.1621-1629, March/April 2015. A. Steimel, "Power-electronics issues of modern electric railway systems," Advances in Electrical and Computer Engineering, Vol.10, No.2, pp.3-10, 2010. B. Zhang, C. Zhao, C. Guo, X. Xiao, L. Zhou, "Controller architecture design for MMC-HVDC," Advances in Electrical and Computer Engineering, Vol.14, No.2, pp. 9-16, 2014. D. Floricau and D. Kisch, "A new nine-level boost PWM rectifier based on stacked multilevel concepts," in Proc. 40th Annual Conf. of the IEEE Ind. El. Society - IECON'2014, pp.1077-1083, Nov. 2014. D. Floricau and T. Tudorache, "A novel generalization of boost-type PFC topologies with multiple switching cells connected in series and parallel," in Proc. IEEE 9th International Symposium on Advanced Topics in Electrical Engineering -ATEE, pp.674-679, May 2015. M. L. Heldwein, M. S. Ortmann, and S. A. Mussa, "Single-phase PWM boost-type unidirectional rectifier doubling the switching frequency," in Proc. 13th European Conf. on Power Electron. and Appl. - EPE, pp.1-10, 2009. M. S. Ortmann, T. B. Soeiro, and M. L. Heldwein, "High switches utilization single-phase PWM boost-type PFC rectifier topologies multiplying the switching frequency," IEEE Trans. Power Electron., Vol.29, No.11, pp.5749-5760, Nov.2014. A. B. Lange, T. B. Soeiro, M. S. Ortmann, and M.L. Heldwein, "Three-level single-phase bridgeless PFC rectifiers," IEEE Trans. on Power Electronics, Vol.30, No.6, pp.2935-2949, June 2015. H. Chen, N. David, and D. C. Aliprantis, "Analysis of permanent-magnet synchronous generator with Vienna rectifier for wind energy conversion system," IEEE Trans. Sustainable Energy, Vol.4, No.1, pp.154-161, Jan.2013. A. Rajaei, M. Mohamadian, and A. Y. Varjani, "Vienna-rectifier-based direct torque control of PMSG for wind energy application," IEEE Trans. on Ind. Electronics, Vol.60, No.7, pp.2919-2929, Oct.2013. S. Hansen, M. Malinowski, F. Blaabjerg, M.P. Kazmierkowski, Sensorless control strategies for PWM rectifier, in Proc. Applied Power Electronics Conference and Exposition- APEC, Vol.2, pp.832-838, 2000. S. L. Sanjuan, "Voltage oriented control of three-phase boost PWM converters," Master Thesis - Chalmers University of Technology, 2010. 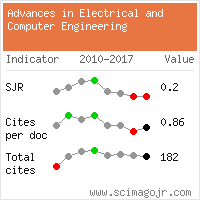 Citations for references updated on 2019-04-22 14:12 in 143 seconds.